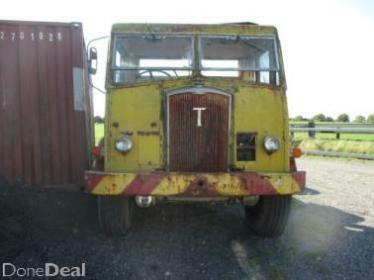 Anyone have photos, plans or ideas on type of recovery equipment that was used on a 1948 6X6 Thornycroft? I'm interested in the 6x6 format you have. Can you supply some photos of the vehicle in question? I would suspect that given the date you have of 1948 it would be ex military design. Thornycroft production tended to be 6x4 as in the Amazon model with Coles cranes attached and mainly for use by the RAF. The Nubian model was a 4x4, again ex military design. However aside from production runs individual trucks for specialst applications were made to order. This has become noticable when looking at export orders ( ie variations on imports seen here). It was all about gaining money. It is of military design as it has the gunners hatch on the cab roof and bar grip tyres on the rear axles. I used this truck 22 years ago to tow a bus off a motorway and it has recently come up for sale. Thinking of buying it but unfortunately the recovery equipment has gone missing. That is not a 6x6, this is what was confusing us! It is a Thornycroft Big Ben 6x4, used in the army as 10 ton cargo trucks or artic tractors. There were not any army recovery versions but have seen a few converted in their civvy use. Thornycroft Big Ben as Richard wrote but other than a prototype I have never seen a 6x6 version. A few were converted to recovery by L W Vass. Would the 1948 date be the build date or the date it was first registered for civilian use after being sold off from the military? The Big Ben came into service at the beginning of the 1950's, it was not a wartime vehicle. I don't think they built as early a 48 I don't know but would suggest around mid 50 to late 50s the one I had came out of ruddington 81. very heavy rugged built chassis. simple design. Huge petrol engine but enough room to fit desiel in eg Leyland 680 etc I put a Scania in mine. The dealer who I bought it off said he still had an agent in india who were refurbing the for the indian army. Paid £650 for it with cracked block and recon engine in crate. The Big Ben name was also used for a 'lightweight Antar' IIRC and which was offered as a 6x6 for oilfield use. The 6x6 format was used by Thornycroft during the 1960's and 70's as airfield crash fire appliances. This was also called a Nubian. A specialist role than continued to the end of Thornycroft production in 1976. Thank you all for the information. I have yet to go have a look at it and determine exactly what it is. It has been for sale for almost a year but at 4,000 euros, I don't think its going anywhere soon. Was going to offer 1K. ?? Would a general cargo version have a winch fitted behind the cab? Was tempted but intimidated by one of those at Aston Down 1995, it sold way too cheap! hi maybe able to help you here.That photo of the thornycroft you posted is if im not mistaken the remains of the one my dad built and drove in birmingham as a recovery vehicle for many years.it was sold to a garage in ireland years ago.if youre intrested i still have loads of photos of it with its recovery gear.paperwork about it.It stood out as it has the yellow/red bumper.feel free to contact me love that old truck. 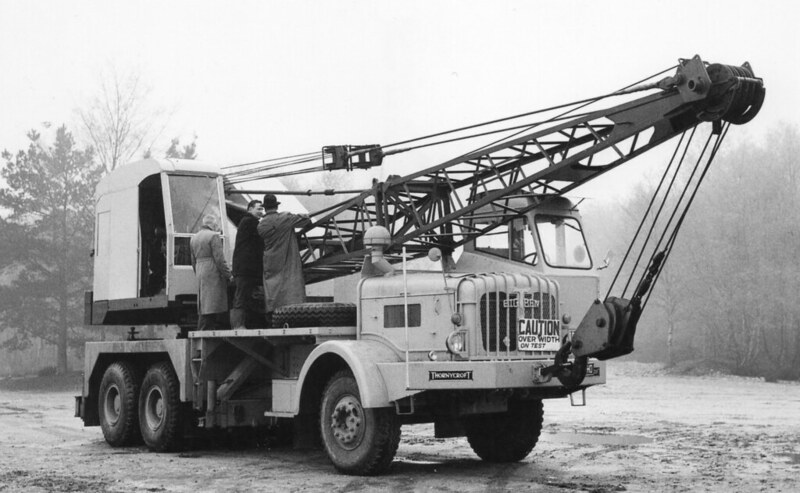 In addition to the 6x4 Big Ben Thornycroft also produced a Big Ben crane carrier chassis, typically with a Jones electric crane. I thought from 1949. It carried a transfer gearbox behind the main 5 speed box. The PTO came out the top of the transfer case to drive the crane and which would also be handy to drive a winch. A friend this side of the water is desperate to source one of these transfer gearboxes. The 11 litre petrol Big Ben mentioned also had the transfer case, but without the PTO internals. The PTO came out the top of the transfer case to drive the crane and which would also be handy to drive a winch. Do you mean the PTO drove a dynamo for the electric crane rather like the wartime EMA? I purchased this Thornycroft about 4 months ago and have been enjoying the restoration so far. A big thanks to Cosrec for the warning about the asbestos, I would never have thought of it. If anyone has any information on the vehicle I would love to learn the history of it. I also have acquired parts lists, drivers handbook and wiring manuals which I will gladly pass on if any use to anyone.